7/21 Cup of Coffee: It was a rough Wednesday for the affiliates, as the DSL Sox1 were the only squad that came out on top. Pawtucket's late rally fell short, while Portland and Greenville squandered solid offensive performances in their losses. Despite a late rally, the PawSox dropped the series finale. Starter Keith Couch dropped to 1-3 despite seven solid innings. He allowed three runs on seven hits while striking out seven. Joe Kelly added an inning of relief, and allowed a hit and a walk while striking out a pair. Down, 3-0, in the top of the ninth, the PawSox pulled to within a run on back-to-back sacrifice flies from Christian Vazquez and Brennan Boesch. Unfortunately, the rally was squashed with the tying run at third base. Portland dropped its second straight, losing the rubber game against Trenton. Kevin McAvoy fell to 6-5, allowing five runs on six hits over six innings. He struck out six. Ty Buttrey added 1 1/3 innings of relief, allowing a run on two hits. Jake Drehoff tossed 2/3 of an inning, allowing a run. The Sea Dogs got off to a quick start; Aneury Tavarez tripled to leadoff the first, and he was brought home on a ground out by Mauricio Dubon. 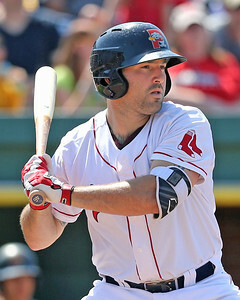 Down, 5-1, in the sixth, the Sea Dogs pulled within a run on a three-run home run from Cody Decker (pictured, above right). Decker and Tavarez both had two hits to lead the Portland offense. Despite collecting eleven walks, the Greenville Drive were outpaced by the Grasshoppers. Dedgar Jimenez allowed five runs on eight hits and a walk while striking out four in five innings of work. Trevor Kelley added two scoreless innings of relief, allowing just two hits and punching out four. Gerson Bautista allowed three runs on a hit and three walks in just an inning of relief. It was his second appearance with the Drive since being called up from Lowell. Down, 3-0, in the fourth, Tate Matheny scored on a double play to put the Drive on the board. In the ninth, Luis Alexander Basabe launched a two-run homer to round out the scoring. The Drive left twelve men on base and were just 2 for 13 with runners in scoring position. The Red Sox struck out 16 times and mustered just three hits in the blowout loss. Victor Garcia took the loss, allowing four runs (one earned) on five hits while striking out three in five innings. Ryan Oduber added two innings of relief, allowing two runs on two hits and two walks while striking out four. Jared Oliver was torched for four runs on four hits and a walk in his lone inning of work. Juan Carlos Abreu went 2 for 3. Ritzi Mendoza improved to 4-0, hurling six innings while allowing one run on three hits and striking out three. Juan Perez picked up his first save, allowing two runs on four hits in three innings. Down, 1-0, in the fourth, the Red Sox plated five runs; they benefitted from an RBI single from Eddy Reynoso, a throwing error, Willis Figueroa's bases-loaded walk, an Elwin Tejeda sacrifice fly, and a run-scoring double play. The Red Sox expanded their lead in the fifth, bringing home three on a Reynoso two-run double and a wild pitch. Despite outhitting the Astros, 9-4, the Red Sox were just 1 for 10 with runners in scoring position and left 10 men on base. Bryan Mata took the loss despite a stellar performance, allowing one run on a hit and a walk while striking out seven in six innings of work. Andres Jimenez allowed two runs on two hits in two innings of relief. The Red Sox lone run came in the eighth on a run-scoring error. Eduard Conde (three hits) and Yeison Coca (two hits) paced the offense. The DSL Sox have now dropped four straight. Player of the Night: Ritzi Mendoza, who improved to 4-0, gets the nod. The 20-year-old right-hander allowed one run on three hits while striking out three in six innings. Mendoza has been impressive in his eight starts this season, compiling a 1.05 ERA while striking out 34 and walking eight in 42 2/3 innings.